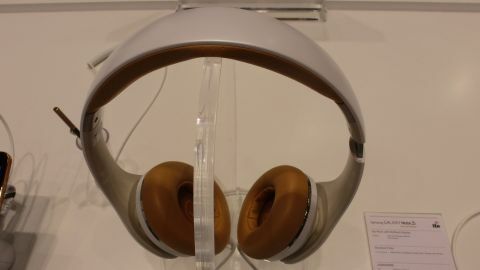 Samsung's belated dive into headphones has caught our attention, and we took the opportunity to get our hands on the Samsung Sound OG900 on-ear headphones which were on show at MWC 2014. The 'phones boast a rigid white plastic frame with tan cups, which Samsung insists took its 'minimal organics comforting' style cues from pebbles. Testing headphones on a show floor is always fraught with difficulty, but the early signs for OG900 are good, although the lack of an announced price makes it difficult the put them in context. The design will, dependent on your own views, either sink like a stone (sorry) or be right up your beach (sorry), but the folding frame felt robust enough and it looked pretty nice on the head. The fit was comfortable - with the cups sitting nicely on our ears - and the pressure exerted felt just about right. On to the sound and we have to say that we were quite impressed with the OG900's performance in testing noisy circumstances. The test reel music we listened to was sonorous and fairly rich - not overly bassy but perhaps losing some of its quality in the higher ranges. We're looking forward to getting the headphones in for a proper expert listen so we can give you a more rounded view. We'll be keeping our ears to the ground for a review unit of the Samsung Sound OG900 headphones and any official pricing. The Korean giant's foray into headphones is an interesting one, and although they have gone down the Beats solid plastic route, the design is interesting and may well appeal to many. Sound-wise, the early impressions are good - but we'll expand on our first impressions when we have more time (and our own musical choices) to run them through their paces.